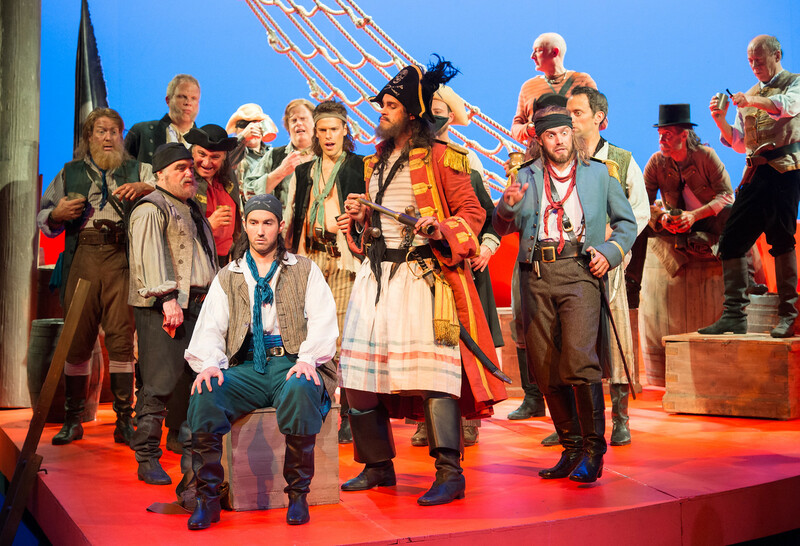 This year English National Opera ( ENO) revived Mike Leigh's production of Gilbert and Sullivan's The Pirates of Penzance (see my review) whilst English Touring Opera (ETO) unveiled a new production of Patience (see my review). And we have the promise of ENO's new production of Iolanthe next year. Thus providing a rare opportunity for Londoners to catch professional opera companies performing Gilbert and Sullivan, in fact a rare opportunity to encounter G&S period. Granted, the operas remain popular with fringe companies and with amateurs groups, who provide a valuable service. Yet Gilbert and Sullivan operas no longer seem to be welded into the national operatic consciousness in the way they used to be. When discussing the recent ENO revival, a friend commented that it was welcome because no-one seems to do Gilbert and Sullivan any more. When I was a student in Manchester (1973-1976) there was a regular stream of visiting opera companies to the city, and lightening the diet was a regular visit from the D'Oyly Carte Opera Company. Their productions were hardly innovative, based on the original play books, and there was an element of stylised ritual and routine to them, but in the the hands of greats like John Read there were magical moments. And if you wanted more innovative stagings, ENO had productions too including Patience (with Derek Hammond Stroud famously alternating Bunthorne in Patience and Alberich in Das Rheingold). A similar situation occurred with Handel opera, where the Handel Society provided an annual festival in London, topped up by occasional productions at ENO and Kent Opera. In the intervening years Handel opera has, if not gone main stream, at least become a frequent visitor, whereas the status of G&S seems to have gone into reverse. The rash of professional productions which happened when the operas came out of copyright has not really been followed up. Perhaps a suggestive factor is that whilst music colleges do Handel opera productions, G&S never seems to make it into college productions, only Viennese and French operetta. This is strange because, as the ENO & ETO productions showed, the operas offer ideal roles for young artists combined with some cracking character roles for older singers. Gilbert's obsession with poking fun by adding an element of Topsy-Turvey brings an anarchic energy to his plots which would seem to chime in with the modern, post-Monty Python comedic sensibility. Gilbert's librettos are tightly constructed, and do not lend themselves to radical re-working in the way that the poorer librettos often used by Strauss, Offenbach and Lehar can often re-written to suit the circumstances. Part of the problem is that G&S is difficult to bring off in larger theatres. If a performance needs surtitles, then it has failed. A good performance of G&S is very much about the combination of music and words. 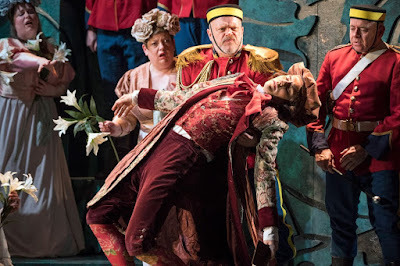 It is easy to decry the archness and conventions of Gilbert's librettos, but whereas regular opera goers seem to embrace them with joy and forgiveness, the operatic establishment has a more nervous attitude. Yet it is this dependence on the word which sets G&S off from continental operetta. Gilbert was as strong a creative person in the partnership as Sullivan, and a good production needs to embrace them both. The Gondoliers has always been very popular with opera companies, perhaps because it has a weak libretto and Sullivan's music almost verges on the operatic. At English National Opera, they have signally failed to develop a consistent house style for G&S. Jonathan Miller's production of The Mikado, for all its failure to understand the basic raison d'etre of the opera, is a brilliant theatrical beast, but this was followed up by Ken Russell's travesty on Princess Ida. The more recent Gondoliers and Mike Leigh's Pirates of Penzance represent a return to more traditional elements of staging. With ENO's planned production of Iolanthe we are promised physical comedy, let us hope that the words are respected too. We now have a National Gilbert and Sullivan Company, Opera North recently made a venture into G&S with Ruddigore and Scottish Opera toured The Mikado last year. So, if not a Gilbert & Sullivan revival, at least things are looking promising.